Chef, writer, and businesswoman, Akasha Richmond holds a strong presence with the healthy crowd, displaying a resumé of celebrities including Barbra Streisand, Carrie Fisher, Michael J Fox, and Pierce Brosnan. Chef Akasha, as she is known, has been specializing in natural and organic cooking for the Hollywood elite for more than 20 years, along with catering parties for MTV, the Academy Awards, and the Sundance Film Festival. 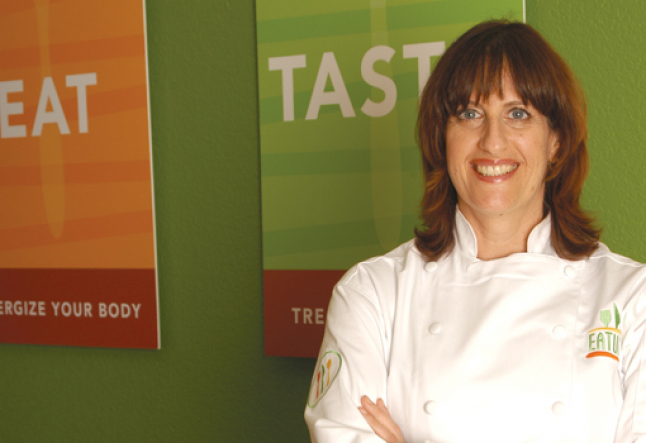 She also owns Akasha’s Visionary Cuisine, and is the co-founding chef of Eaturna. Her time in the kitchen is not the only matter keeping her busy, as she is also the spokesman for Silk soymilk, a contributing editor for Vegetarian Times Magazine, author of two recipe books, and guest chef for many conventions and television news programs. YT: What has been the most challenging aspect of your personal journey, and how has that strengthened you? Chef Akasha Richmond: I was a painter before I became a chef, so combining creativity and business was challenging at first – the best advice I ever got was from a good friend who said to “take the big commercial projects so you can afford to do the small creative ones.” Learning how to juggle art and business has strengthened me in every way. Chef Akasha Richmond: My greatest strength is my passion for my work, and my deepest weakness is that I am terrible at paperwork. Chef Akasha Richmond: Loving everything I do, whether it’s cooking, writing, or promoting, but quite frankly I have never been able to sleep in, even on vacation, or on days off. Chef Akasha Richmond: Yogi Bhajan. I loved cooking creative fusion-Indian dishes with and for him. He was a true teacher – both directly and indirectly, and when I eventually disagreed with him, and he refused to talk to me, I learned the greatest lesson of all – that it was OK to disagree, and be myself, and move on. Chef Akasha Richmond: After high school, I spent sometime on an organic farm on Kauai – chanting mantras, eating new things like fresh soybeans (edamame) and seeing life lived in a different way. After that I moved to California, started studying yoga, met Gurmukh and Yogi Bhajan, came to Los Angeles (originally to learn to be a yoga teacher), started working at the Golden Temple restaurant, and cooking became the number one focus in my life. Chef Akasha Richmond: I look at success as two-fold: professional and personal. Some define professional success as fame, fortune and power, but for an artist like me, success is a constant process. Whether it’s a catered party, a new restaurant, a book or a movie, you go from project to project, and each one is measured by its success. Personal success is all about attitude, and coming back strong, even if you think you failed in one of your endeavors. That’s where physical or spiritual discipline really helps. Chef Akasha Richmond: Having my cookbook Hollywood Dish published along with the opening of Eaturna, and the opening of my restaurant Akasha in Culver City, California. Chef Akasha Richmond: Seeing my daughter Amrit find her own creative path. She’s an amazing stylist and photographer ... And my cat Frankie brings me a special kind of joy every day. Chef Akasha Richmond: Once you find your passion and talent, stick with it, believe in yourself, and stay true to your path.